From the files of The Gazette March 10, 1994. Margaret (Margot) Rhys Davies was born in St. John's in the early 1920s, the youngest daughter of Daniel James Davies and Elizabeth Margaret Evans, both of Wales. Her father had come out to Newfoundland in the late 1910s where he became Science Master at the Methodist College. Margot began her formal education at Bishop Spencer College, St. John's; after her family's return to England in the mid-1930s, she continued her education at Southlands, Harrow-on-the-Hill and at the Abby School, Malvern Wells. While at Bishop Spencer, Margot had been introduced to the stage. There she performed in a school production of Shakespeare's A Midsummer Night's Dream. Upon leaving school in England, she embarked on a stage career with the Dublin Gate Company at the Westminister Theatre in London and later with the Oxford Repertory Company. 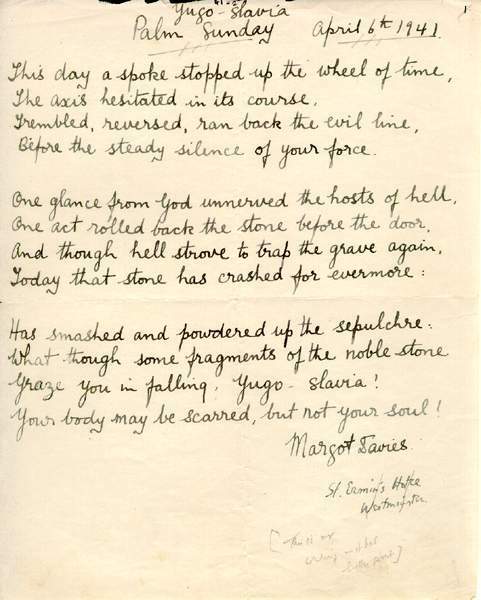 The original copy of this poem from Calling Newfoundland is written in Margo Rhys Davies' own hand. Courtesy of Archives and Special Collections (MF - 214), Memorial University of Newfoundland, St. John's, NL. Margot Davies may have had a long and, perhaps, a distinguished stage career if World War II had not intervened. With the outbreak of the war, she gave up the stage to work with her father at the Newfoundland Office in London. She became Honourary Assistant Secretary of the War Comforts Committee, established to look out to the needs of Newfoundland servicemen while they were in Britain. Margot, in many ways, was the committee: "she got beds for the boys ... when beds were unobtainable; she kept them supplied with cigarettes, with socks and balaclavas .... She arranged parties, dances and tours of London for lonely Newfoundland servicemen. She cared for the sick ones, the strays and the stranded." It was through her radio program, however, that her name became a household word in Newfoundland. Beginning on April 23, 1941 she became the host of "Calling to Newfoundland from Britain", a bi-weekly radio program established by the BBC in "recognition of the need for the men of the Newfoundland fighting forces to have some contact with their families and friends at home." Her voice became one of the most recognized radio voices in Newfoundland as each Monday and Wednesday evening she began her broadcasts with the soon familiar "Hello Newfoundland, this is Margot Davies calling from the BBC, London." After the war the program continued, with Margot as host, until shortly before her death in 1972. Her work was recognized by the British Government in 1944 when she was made a Member of the Order of the British Empire. While she has long been recognized as a broadcaster, very few people are aware of Margot Davies penchant for writing. According to her sister, Lady Bagge, Margot began to write poetry while still a schoolgirl and continued to do so throughout her lifetime. Very little was published and it is not known if much of it has survived. George Wilson Knight, Emeritus Professor at Leeds University and a 1974 Guest Lecturer at Memorial University, is responsible for what has been published. He first met Margot Davies at a meeting of the Poetry Society in London in the 1940 and they became lifelong friends. During 1940-1941 they carried on a correspondence; her letters to him often included poems. He kept these letters and in 1981 was successful in getting Memorial to publish a small volume of Margot's poems entitled Calling Newfoundland: Poems 1940-1941. It is a slim volume, 45 poems, less than 80 pages, edited and introduced by Knight. Most are quite short poems, the thoughts and feelings of a woman in London during World War II, faced daily with the war's toll on the soldiers, their families, the city and herself. A British edition of the book was published by Warren House Press in 1982. In his introduction to Calling Newfoundland, Knight states "Manuscripts and related material will be lodged in the Library of the [Memorial] University." In August 1984 Knight turned these materials over to Dr. Raymond Clark of Memorial's Classics Department who was visiting London. Clark, in turn, presented them to Dr. Leslie Harris, Memorial's President, who deposited them in the archives. The collection consists of the original manuscript for the poems written in Margot's hand, and the typescript of the book with Knight's introduction. It is a small collection but an important part of our literary heritage. Often described as a fragile person, Margot Davies died on May 20, 1972, still a young woman. It has been said that she was "burnt out with devotion." In 1974 a plaque celebrating her life was unveiled at Confederation Building, a fitting tribute to a great friend. For other related articles view the Communications section of the Society and Culture Table of Contents.